The building forming the Town Hall and Corn Exchange is a prominent historical landmark in the centre of Newburgh’s High Street. The building, which is ‘B’ listed, has not been used as a civic space since the late 1970’s. 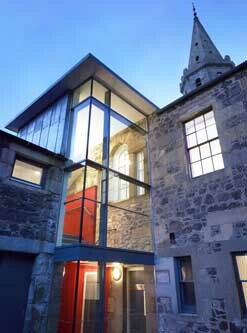 This project has brought the building back to useful life both as a space for the production of visual art and crafts and as a community space for the benefit of local people throughout Fife. The new accommodation consists, in the main, of working studios along with a small residential flat for visiting artists. A public exhibition and events space occupies the original town hall. All these functions are linked together with a new central circulation space, which, along with the studios, overlooks a courtyard. Accessibility was a high priority in this project and we therefore creatively adapted the existing fabric to permit its use regardless of a visitor’s physical abilities.